SunLike fundamentally transforms LED lighting technology by removing the blue LED light source and replacing it with a purple light LED chip. Seoul Semiconductor is bringing the closest light to the sun to market. 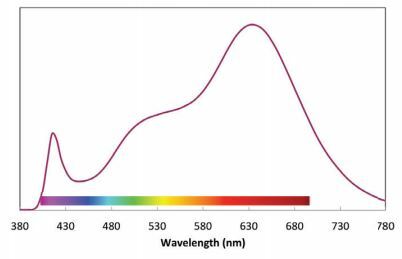 An ordinary LED spectrum is very different to sunlight, whereas SunLike’s spectrum is almost the same. Objects lit by SunLike appear as they would in sunlight. So, is it all that? Or, is this just another of a long and deep list of marketing campaigns making unsupportable claims? Based on this, I would have to call the colorful web graphic as inaccurately distorted to make a product claim. On a scale of 1-10, with 1 being a complete lie and 10 being an accurate representation, I give the promotional graphic a 5 out of 10. It not only distorts the products SPD into something that does not actually exist, it distorts sunlight itself to make its claim. I suggest that it would be of value for SSC to revise the graphic to reduce the distortions that challenge its credibility. Based on this comparison, there are several conclusions one might draw. First, there is indeed a relative difference in blue light content, specifically at the 456nm peak. This is evident in all three CCT’s and represents a significant improvement. 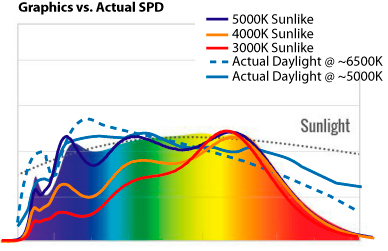 As a portion of total output, the Sunlike products produce a welcome improvement in both mitigating the over-production of blue light in the circadian sensitive 460nm region, but an overall improvement in filling the spectral gap between that peak and the rest of the spectral distribution. This is most apparent in the 5000K and 4000K sources. The difference at 3000K is less significant, but still evident. And the Soraa 3000K LED comes close as well in 3000K, with its blue peak at 405nm, in stead of the 456nm, making it equally good for blue light mitigation. Soraa 3000K 95CRI. Nore blue peak is at 405nm, not the normal 456nm. 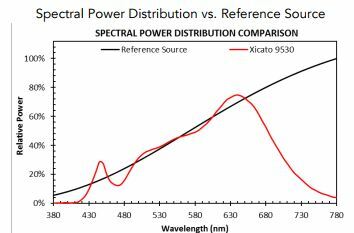 Neither Soraa or Xicato offer anything in 5000K LED, nor does anyone else even close to the SPD of the SSC Sunlike product. Based on this, and comparisons of several other LEDs not shown here, I would rate the claim that the Sunlike LEDs are a significant improvement over other available products a solid 8.5 out of 10, mainly due to the real advantage shown in the 5000K and 4000K CCTs. First, there are very few 5000K LEDs on the market with a high enough CRI to be considered viable. Second, the number of 4000K LEDs with high CRI’s are limited. I do not see a large advatnage to the Sunlike product at 3000K, as at this CCT, there are many options, all with limited blue light content, simply due to the need to down-convert as much of that light as possible to generate the warmer spectral power necessary. The small difference in blue peaks between high CRI 3000K LEDs and Sunlike is arguably marginal. To be brief… While there is a reduction in balance between the 460nm peak that imparts melatonin suppression response, I do not believe that this alone will produce a real driving force in selecting these LEDs over any other. The entire issue of human factors lighting is far more complex that changing the SPD of light sources that are on continuously. As it is now known, circadian entrainment around the 460nm peak is affected mainly early in the day, for a brief period of time, which then shifts to red of around 620nm sometime mid-day. There is not evidence that tinkering with subtle difference in white light sources will have any long-term effect on human health. Illuminance levels, timing, available natural light, and other factors outside the realm of lighting itself play a role in this. In my opinion, the use of “Human Centric” wording has now become a marketing term, like the nearly obsolete “Green” propaganda, that eventually burned itself dry. For this, I give SSC a 2 of 10 for going down this road. I suggest this approach be dropped until there is objective supporting evidence that these products can actually deliver a real benefit. 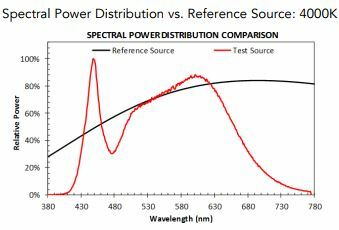 As I noted, the quality of light from this new generation of LED technology, with its re-balanced and fuller spectral power delivery, is going to produce higher light quality. The light from each of the CCTs will appear more neutrally “white” with less of the cyan or orange shifting exhibited by conventional blue pump LEDs. Similar to the improvement in light quality that Soraa and Xicato delivers in their high CRI products, for similar reasons, plus a little more, due to broader tails. The Sunlike 5000K LED is poised to be the most attractive high CCT LED on the market, by a fair margin, with far less distortion of reds and greens, and less harshness overall. On this I score these LEDs a solid 9.0 of 10. In my opinion, the SPD’s produced by the Sunlike products is exactly the direction the entire LED universe needs to move toward. They are not perfect, but are far less flawed than most. The re-balancing of energy in the 460nm region downward into the longer wavelengths, the more complete SPD, and shift of some blue upward into the 405nm region – are all very good things. These LEDs will generate more precise color rendition with less of the harshness and flatness that LEDs are frequently seen as producing. Further, the slightly more full and wider blue tail (400-55nm) of these LEDs at 3000K will go a long way toward reducing the artificially over-red-orange and pinky hue that make them appear less “white” than their idealistic halogen predecessors. I suggest the most significant impact of the Sunlike products will be to present lighting customers 4000K and 5000K products that will be considered attractive, over the current range of products now in the market that feel harsh, cold and flat. 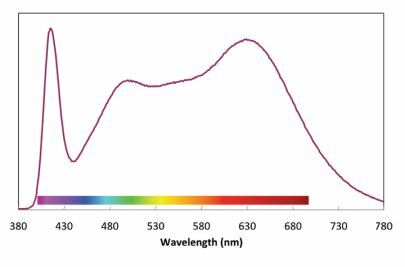 The fuller spectrum, lower blue content, and flatter region between 500nm and 650nm are going to produce far better color appearance and fullness than what is on the market currently. Overall, I give Seoul kudos for this product, and look forward to working with these LEDs in more real-world applications. I use blue blocking lenses to remove the blue light before sleeping. One problem is that white LEDs may be lacking in NIR and red light which is needed to balance with the blue light according to Dr. Mercola. Cytochrome c oxidase absorbs them. That might inspire new designs for LED lamps. I included 660nm and 850nm LEDs in my latest sunrise simulator to balance it with the blue light. Is they any research on its applications in growing crops? If it is cost-effective enough, then that may be a huge market too. Why LEDs are Bad… and Great at the Same Time.